Tottenham boss Mauricio Pochettino’s comments following his side’s 2-0 loss to Crystal Palace in the FA Cup Fourth Round were baffling to hear, and would’ve been sure to offend a number of the club’s supporters who are desperate to see their beloved Spurs win some silverware. However, there are also arguments in favour of what the Argentine said, that could also suggest that what used to be considered an achievement in football is now taking a backseat for financial prosperity. For a manager of one of England’s top clubs to say this must be extremely demoralising for those fans who pay their money to travel all over the country to watch their club, all with the slim hopes of seeing their heroes lift a trophy or two at the end of the season. But Pochettino has his reasons for setting such targets. For a start, just by qualifying for the group stages of the Champions League, a grand total of £13.34m falls into Spurs’ bank account (as per the BBC). In stark contrast, winning the FA Cup final lands just £3.6m (as per the FA). 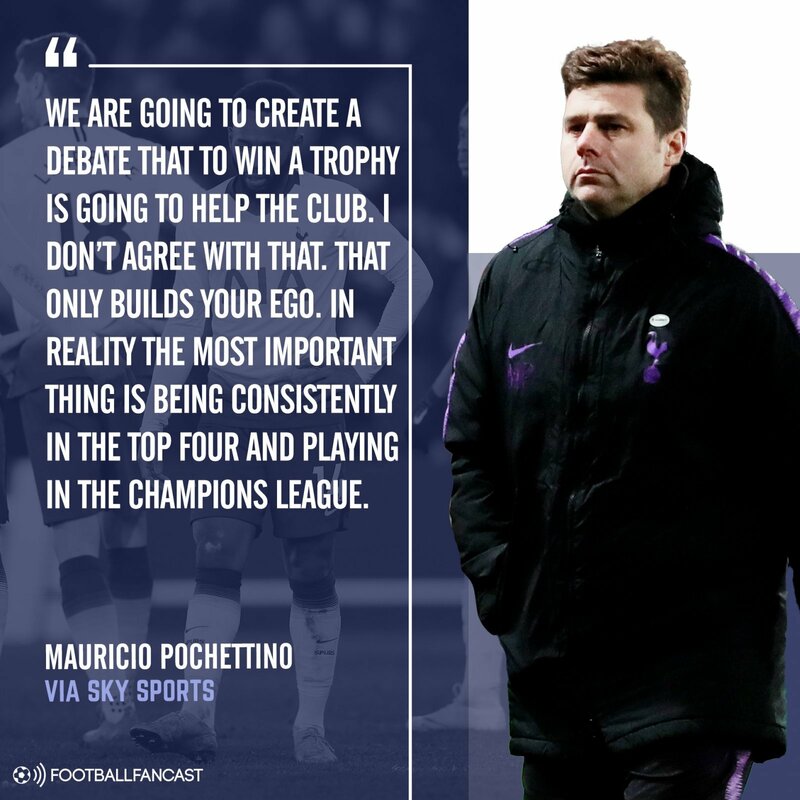 For Pochettino to be able to land the best players around, he needs to be able to afford them with the extra revenue, along with being able to offer them Champions League football, which is where every top player wants to be. However, once such players arrive at the club, along with the world-class players already at his disposal such as Harry Kane, Dele Alli and Christian Eriksen, they will want to litter their personal cabinets with medals, along with the memories that they contain. In that respect, it is a bit of a ‘Catch 22’ for most top clubs – abandon the chance to win trophies in order to satisfy the bank account, or abandon the chance to offer your players the top level of European football so the club can fill the trophy cabinet. Of course, managing both in the same season would be nice, but that is starting to prove an impossible challenge – the last three FA Cup winners, Manchester United, Arsenal and Chelsea, all failed to finish in the Premier League’s top four as they lifted the trophy. More than ever, it’s starting to feel as though the FA Cup has become the biggest victim of the Champions League’s relentless rise. But one thing’s for certain; the barometer of success is changing in football – filling the bank account now takes precedent over filling the trophy cabinet.